Loss or mutation of the mannose 6-phosphate/insulin-like growth factor-II receptor (M6P/IGF2R) has been found in breast cancer. However, whether or not decreased levels of functional M6P/IGF2R directly contribute to the process of carcinogenesis needs to be further verified by functional studies. In this study, using viral and ribozyme strategies we reduced the expression of M6P/IGF2R in human breast cancer cells and then examined the effect on growth and apoptosis of these cells. Our results showed that infection of MCF-7 cells with the adenovirus carrying a ribozyme targeted against the M6P/IGF2R mRNA dramatically reduced the level of transcripts and the functional activity of M6P/IGF2R in these cells. 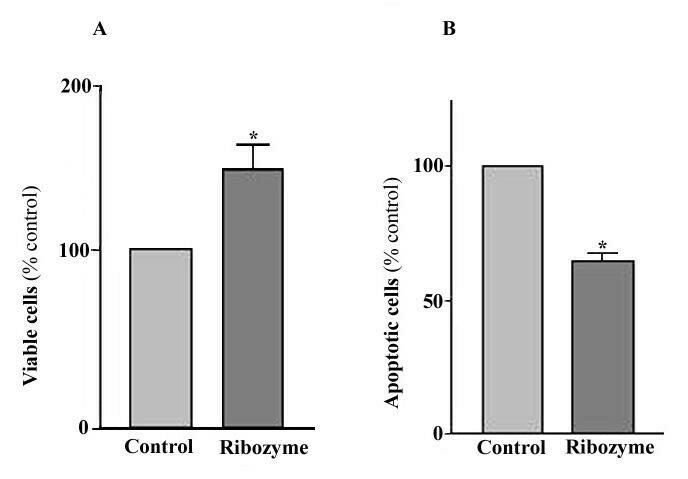 Accordingly, cells treated with the ribozyme exhibited a higher growth rate and a lower apoptotic index than control cells (infected with a control vector). Furthermore, decreased expression of M6P/IGF2R enhanced IGF-II-induced proliferation and reduced cell susceptibility to TNF-induced apoptosis. These results suggest that M6P/IGF2R functions as a growth suppressor and its loss or mutation may contribute to development and progression of cancer. This study also demonstrates that adenoviral delivery of the ribozyme provides a useful tool for investigating the role of M6P/IGF2R in regulation of cell growth. With one million new cases each year, breast cancer is the most common cancer among women and is the leading cause of death in women 30 to 70 years of age in the world. Breast cancer results from genetic and environmental factors including diet, radiation and hormones [1–5]. The molecular events involved in breast carcinogenesis, however, remain to be elucidated. Numerous studies have shown that polypeptide growth factors such as insulin-like growth factors (IGFs) are mitogens for breast cancer cells [6–9]. The IGF-I and IGF-II signal through a common tyrosine kinase receptor, the insulin-like growth factor 1 receptor (IGF1R), and have mitogenic and cell survival actions that may promote tumor development. Modulation of this mitogenic pathway occurs in part via the M6P/IGF2R, which functions in the internalization and degradation of IGF-II . M6P/IGF2R is also important in activation of TGF-β, a potent growth inhibitor for most cell types, and in binding, transport and activation of lysosomal enzymes, such as cathepsins [12, 13]. It has been shown that M6P/IGF2R expression is significantly reduced in both rat and human hepatocellular carcinomas . Loss of hetorozygosity (LOH) at the M6P/IGF2 receptor gene locus on 6q26-27 coupled with somatic point mutations in the remaining allele has recently been demonstrated in liver and breast cancers [15–23]. In addition, somatic mutations of the M6P/IGF2R gene were also found in prostate cancer, lung carcinoma, and genetically unstable cancers of the endometrium, brain, stomach and colorectum [24–29]. The findings of LOH and mutations of M6P/IGF2R in a wide variety of tumor types have led to the proposition that the M6P/IGF2R is a tumor suppressor gene. In addition to genetic data, a tumor suppressor gene candidate has to meet functional criteria. The functional characteristics of a tumor suppressor gene have not been well established for M6P/IGF2R. Thus, further studies that address the relationship between the functional M6P/IGF2R level and cell growth activity are needed. To verify whether decreased levels of functional M6P/IGF2R can provide a growth advantage for cancer cells, we used viral and ribozyme strategies to reduce the expression of M6P/IGF2R in human breast cancer cells and then examined the effect on growth and apoptosis of these cells. A 49 bp M6P/IGF2R ribozyme oligonucleotide, 5'-GAATTCTCCACACTGATGAGCCGCTTCGGCGGCGAAACATTCAACGCGT-3' and the corresponding reverse complementary strand were synthesized. The fragments were subcloned into pRz951 to produce a plasmid (designated as pRz-IGF2R) containing a ribozyme targeted against the M6P/IGF2R. For construction of the recombinant adenovirus containing the M6P/IGF2R-ribozyme (pAd-GFP/Rz-IGF2R), the segments containing the ribozymes were amplified by PCR and cloned into a pAdTrack-CMV vector and then recombined homologously with an adenoviral backbone pAdEasy 1 vector to generate pAd-GFP/Rz-IGF2R, following the protocol described by He et al . The pAd-GFP/Rz-IGF2R carries both the Rz-IGF2R and GFP (as reporter) genes, each under the control of separate cytomegalovirus (CMV) promoters. Another viral vector, pAd-GFP, which carries the GFP gene only under the control of the CMV promoter, was generated and used as a control vector. The adenoviral vector DNA were linerized with Pac I and transfected into the replication-permissive 293 cells (E1A transcomplementing cell line) using Lipofectamine (Life Technologies) to produce E1-deleted, replication-defective recombinant adenovirus as described previously . Large-scale amplification of the recombinant adenovirus in 293 cells was followed by purification using a discontinuous CsCl gradient. The constructs were confirmed by enzymatic digestion and DNA sequencing. Plasmids containing the ribozyme or the substrate (either 45 bp of M6P/IGF2R mRNA or an unmatched sequence 5'-ATATTGTCCAGTGC-3') were linearized with Mlu I. All transcripts were generated with T7 RNA polymerase (Promega). Substrate transcripts were labeled by incorporation of [32P]UTP (10 μCi/ml; Nen Life Science Products, Inc.). Specific activity of the [32P]UTP and the base composition of each substrate molecule were used to calculate substrate concentration. Ribozyme transcripts were quantified spectrophotometrically. Cleavage reactions contained 30 nM substrate RNA, increasing amounts (60 nM) of ribozyme, 20 mM MgCl2 and 20 mM Tris-HCl (pH 8.0), 1 μl DTT, and 1 μl RNA inhibitor in a final volume of 10 μl. Cleavage reactions were incubated at 37°C for 2 hrs. Reactions were stopped by addition of loading buffer: 80% formamide, 10 mM Na2EDTA (pH 8.0), and 1 mg/ml each bromophenol blue and xylene cyanol. Cleavage products were analyzed on 15% polyacrylamide and 8 M urea denaturing gels. NIH Imager was used to quantitate product and substrate fragments. MCF-7 cells were cultured in DMEM medium containing 10% FBS at 37°C in a tissue culture incubator with 5% CO2 and 98% relative humidity. Cells were used for experiments after 2–3 days in culture. Viral infections were carried out by adding viral particles at various concentrations (usually, 2 × 108 virus particles/ml) to culture medium containing 2% FBS. Initially, optimal viral concentration was determined by using Ad-GFP to achieve an optimal balance of high gene expression and low viral titer to minimize cytotoxicity. After 24 hrs of incubation, the infection medium was replaced with normal (10% FBS) culture medium. For treatment with IGF-II, cells were incubated with 50 ng/ml IGF-II after infection with Ad-GFP/IGF2R-Rz or Ad-GFP. Seventy two hrs post infection, cells were used for analysis of M6P/IGF2R gene expression and its effect on cell growth. The M6P/IGF2R transcripts were determined by RT-PCR using the GeneAmp EZ rTt RNA PCR kit (Roche). Total RNA was extracted from cultured cells using an RNA isolation kit (Qiagen), according to the manufacturer's protocol. M6P/IGF2R transcripts were amplified using primers 5'-GACAGGCTTGTCCTGAGTTA-3' and 5'-TTCTGCTCTGGTTCTGCATG 3', specific to the M6P/IGF2R receptor. Each RT-PCR assay was performed in triplicate. Primers specific for human β-actin cDNA were added to a parallel reaction to standardize for variations in PCR between samples. PCR products were resolved on a 1.0 % agarose gel, visualized under UV light and quantitated using NIH Imager. Cells were incubated at 37°C for 2 hrs in serum-free DMEM containing 125I-labeled IGF-II (0.5 ng/ml) with or without excess unlabeled IGF-II (2 μg/ml). Following the incubation, the cells were washed three times with ice-cold PBS, and cell-associated radioactivity was determined by a γ-counter. Specific internalized 125I-IGF-II was calculated by subtracting the counts of samples with excessive unlabeled IGF-II from that without unlabeled IGF-II, and normalized to protein content. Binding of β-glucuronidase was assayed as described previously [31, 32]. Briefly, cells were permeabilized with 0.25% saponin in 50 mM Hepes (pH 7.0), 150 mM NaCl, 5 mM β-glycerophosphate, 0.5% human serum albumin, and 10 mM mannose-6-phosphate (M6P) for 30 minutes on ice. The cells were washed three times with ice-cold PBS containing 0.05% saponin. They were incubated with 20,000 units/ml β-glucuronidase from bovine liver (Sigma) in 50 mM Hepes (pH 7.5) containing 150 mM NaCl, 5 mM β-glycerophosphate, 0.5% human serum albumin, 0.5% saponin with or without 10 mM M6P overnight on ice. Cells were washed five times with ice-cold PBS containing 0.05% saponin and sonicated in 100 mM sodium acetate (pH 4.6). The protein concentration of solubilized cell extract was measured and enzyme activity was assayed as follows: for each reaction 50 μl cell extract were added to 500 μl of 100 mM sodium acetate (pH 4.0) containing 1 mM paranitrophenyl (PNP)-β-glucuronide (Sigma) as substrate. After an incubation period of 3 hours at 37°C, 500 μl 1 M Na2CO3 were added to each reaction and the absorbance was measured at 400 nm. Experimental values were compared to a standard curve that was constructed using 1–100 nM solutions of PNP (Sigma) in 500 μl 100 mM sodium acetate and 500 μl 1 M Na2CO3. Specific activity was calculated as nM of PNP produced/hour/mg of protein. MCF-7 cells were grown in culture plates (tissue culture grade, 12 wells, flat bottom) in a final volume of 1 ml serum-containing culture medium per well, in a humidified atmosphere at 37°C and 5% CO2 for 3 days. After infection with Ad-GFP/IGF2R-Rz or Ad-GFP, cells were incubated with or without 50 ng/ml IGF-II for 4 days. 100 μl MTT labelling reagent were added to each well and incubated for 4 hrs, followed by addition of 1 ml solubilization solution into each well. The cells were incubated at 37°C overnight. Spectrophotometrical absorbency of the samples was measured using an UV-visible Recording Spectrophotometer with wavelength of 550–690 nm. In addition, the total number of viable cells in each treatment group was counted by a trypan blue exclusion method using a hemocytometer. MCF-7 cells were infected with Ad-GFP or Ad-GFP/Rz-IGF2R. Seventy two hrs post infection, cells were treated with TNF (0.1 ng/ml) for 24 hrs. Apoptotic cells were identified by Hoechst staining using the Vybrant™ Apoptosis Kit #5 (Molecular Probes) according to the manufacturer's protocol. In addition, after infection with Ad-GFP or Ad-GFP/Rz-IGF2R and treatment with TNF, cell viability was assessed using the MTT assay Kit (Roche Molecular Biochemicals) and cell apoptosis was determined using the Cell Death Detection ELISA Kit assay (Roche Molecular Biochemicals) according to the manufacturer's protocol. Students's t-test was used to evaluate the difference between two values. Each experiment was repeated at least three times. Statistical significance was accepted at the level of p < 0.05. The M6P/IGF2R ribozyme we constructed has 13-bp binding arms complementary to the target site of M6P/IGF2R mRNA, and a catalytic core (Fig. 1A). To evaluate the bioactivity/specificity of the ribozyme and the accessibility of the target site, a cleavage reaction in vitro was performed. The substrates, [α-32P] labeled RNA transcripts containing 45 bp of M6P/IGF2R mRNA or an unmatched sequence, were incubated with the ribozyme as described (see Materials and Methods). The ribozyme cleaved only the M6P/IGF2R mRNA into the expected products. In this assay, the hammerhead ribozyme was able to cleave about 50% of the M6P/IGF2R target within 2 hr of incubation, and by 12 hrs, more than 90% of the M6P/IGF2R target was converted to the expected products (Fig. 1B). These results indicate a high efficiency and specificity of the ribozyme in vitro. Hammerhead ribozyme structure and target sequence of the M6P/IGF2R mRNA (A) and ribozyme activity against M6P/IGF2R RNA in vitro (B). 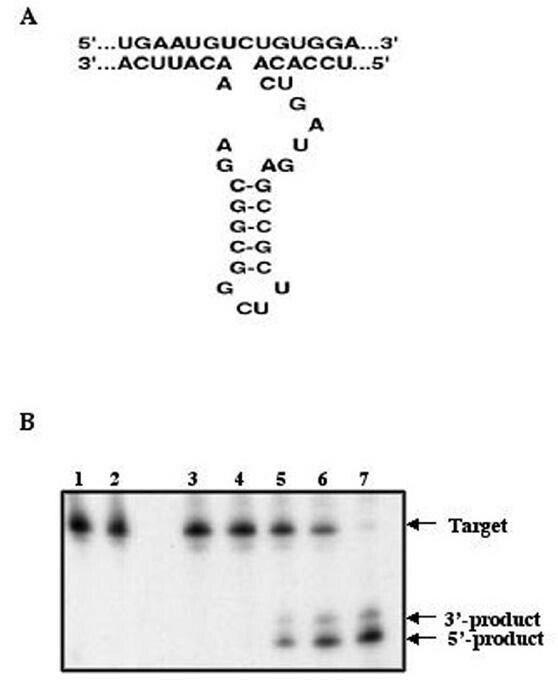 32P-labeled RNA (40 nM) containing the M6P/IGF2R target sequence was incubated with the hammerhead ribozyme (60 nM) and the reaction products were separated on a polyacrylamide gel. The ribozyme cleaves the M6P/IGF2R target efficiently in vitro. Lane 1: Unmatched target alone; Lane 2: Unmatched target incubation with ribozyme at 12 hours; Lane 3: Specific target alone; Lane 4: Specific target incubation with ribozyme at time 0; Lane 5–7: Specific target incubation with ribozyme at 1, 2 and 12 hours. To test whether infection of cultured cells with the Ad-GFP/Rz-IGF2R can induce the expression of the ribozyme (Rz-IGF2R), total RNA was extracted from cells infected with Ad-GFP/IGF2R-Rz or Ad-GFP, and subjected to RT-PCR using ribozyme-specific primers. As shown in Fig. 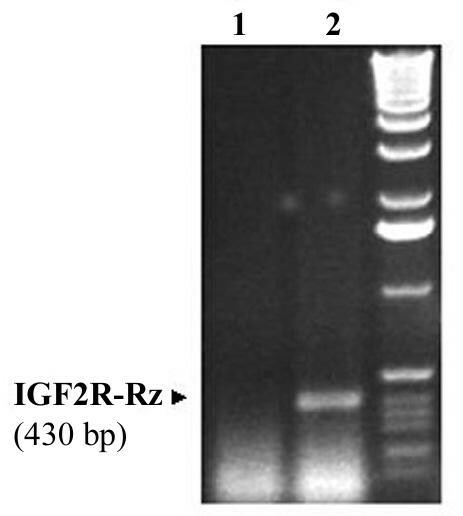 2, infection of MCF-7 cells with Ad-GFP/Rz-IGF2R resulted in positive expression of the ribozyme as determined by RT-PCR. As expected, the ribozyme sequence-specific primers produced a 430-bp PCR fragment only in cells infected with Ad-GFP/Rz-IGF2R, but not in cell infected with the control viral vector Ad-GFP. RT-PCR detection of the M6P/IGF2R ribozyme expressed in MCF-7 cells. MCF-7 cells were infected with Ad.GFP.Rz-IGF2R or Ad.GFP. Seventy two hrs post infection, cells were collected and total RNA extracted. The presence of the ribozyme was detected by RT-PCR using primers specific to the ribozyme. Lane 1: Cells infected with Ad.GFP; Lane 2: cells infected with Ad.GFP.Rz-IGF2R. To examine the ability of the ribozyme to reduce levels of M6P/IGF2R mRNA in MCF-7 cells, total RNA was extracted from cells infected with Ad-GFP/IGF2R-Rz or Ad-GFP, and subjected to RT-PCR using M6P/IGF2R-specific primers. A primer specific for human β-actin was added to a parallel reaction to serve as an internal standard. Cells were used 72 hrs post infection with average infection efficiency of 50–60% (for which a viral dose used had minimal cytotoxicity). The RT-PCR product of M6P/IGF2R was 730 bp, and the β-actin product was 285 bp. As shown in Fig. 3, the Ad-GFP/Rz-IGF2R-infected cells exhibit a significantly lower level of M6P/IGF2R mRNA than Ad-GFP-infected cells, with a reduction of about 40%. There was no significant difference in the level of M6P/IGF2R mRNA between Ad-GFP-infected cells and uninfected cells (data not shown); indicating that infection with the adenovirus itself did not alter the endogenous M6P/IGF2R mRNA level. These results demonstrate that the ribozyme was highly effective in suppressing M6P/IGF2R expression in cultured MCF-7 cells. Effect of the ribozyme on the level of M6P/IGF2R mRNA in MCF-7 cells. A: a representative RT-PCR result showing the levels of M6P/IGF2R (lanes 3 and 4) and the corresponding amounts of β-actin mRNA (lane 1 and 2) in ribozyme-treated (lane 1, lane 3) and in control cells (lane 2, lane 4). B: bar chart showing percent change in M6P/IGF2R mRNA of ribozyme-treated cells relative to the mRNA fraction in control cells (normalized to β-actin). Total RNA was isolated from cultured MCF-7 cells infected with Ad.GFP/Rz-IGF2R or Ad.GFP for 72 hrs, and then subjected to RT-PCR using M6P/IGF2R specific primers and β-actin as an internal standard. The data are the mean ± SE of three separate experiments (n = 3, *, p < 0.05 versus control). To determine the effect of the ribozyme on the functional activity of M6P/IGF2R, the binding and internalization of exogenous 125I-IGF-II was measured in cells infected with Ad-GFP/Rz-IGF2R or Ad-GFP. As shown in Fig. 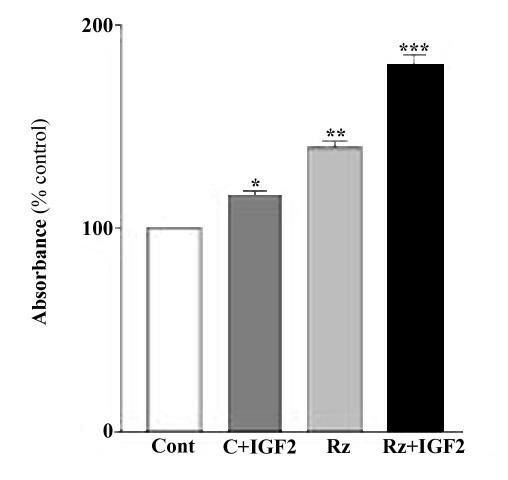 4A, cells infected with Ad-GFP/Rz-IGF2R had a corresponding reduction of ~40% in 125I-IGF-II internalization when compared with control cells (infected with Ad-GFP). We also examined the effect of the ribozyme on the M6P-binding activity of the M6P/IGF2R using the M6P-bearing lysosomal enzyme, β-glucuronidase, as a probe. The results showed that the maximal M6P-binding capacity of MCF-7 cells treated with the ribozyme was about 39% less than that of controls (Fig. 4B). Furthermore, we assessed the ability of MCF-7 cells to internalize exogenous β-glucuronidase after treatment with ribozyme. Similarly, the M6P-inhibitable endocytosis of β-glucuronidase by ribozyme-treated MCF-7 cells was about 38% less than that of control cells (Fig. 4C). These results confirm that the number of functional M6P/IGF2R in ribozyme-treated cells was reduced. Effect of the ribozyme on the internalization of 125I-labeled IGF-II (A). Ribozyme-treated or control cells were incubated in medium containing 125I-labeled IGF-II with or without excess unlabeled IGF-II. Following incubation, cells were washed and cell-associated radioactivity was determined using a γ counter. Determination of binding (B) and endocytosis (C) of M6P-containing proteins in MCF-7 cells. The M6P-bearing enzyme β-glucuronidase was used as a probe. The M6P-inhibitable binding was measured by incubating saponin-peameabilized cells with β-glucuronidase in the presence or absence of M6P. The M6P-inhibitable uptake was determined by incubating cells with medium containing β-glucuronidase in the presence or absence of M6P. Following incubation, cells were washed extensively, and cell-associated β-glucuronidase was measured fluorometrically. Each point, the mean of three separate experiments (n = 3; *, p < 0.05; versus control). We examined the effects of ribozyme-induced M6P/IGF2R down-regulation on the growth of cultured MCF-7 cells. We did not observe any difference in cell growth between GFP-only infected and non-infected cells (data not shown). Thus, all subsequent experiments were performed using GFP-only infected cells as control. Assessment of cell proliferative activity by MTT assay and counting of viable cells (data not shown) indicated that the number of MCF-7 cells in ribozyme-expressing cultures was significantly higher than that in control cultures (Fig. 5). These differences in growth pattern and cell number were even more significant when the cultures were treated with exogenous IGF-II (50 ng/ml, supplemented to culture medium) (Fig. 5). 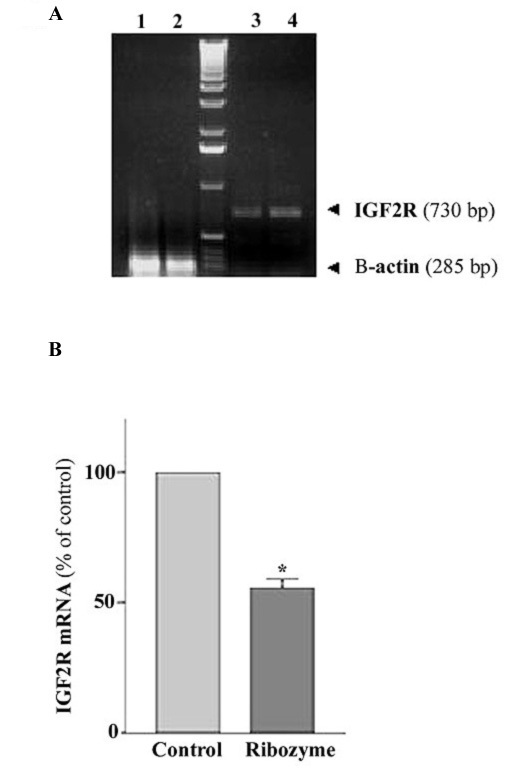 These results suggest that decreasing M6P/IGF2R expression by the ribozyme can enhance proliferation of human breast cancer MCF-7 cells via an IGF-II-related mechanism. Effects of the ribozyme on the proliferation of MCF-7 cells. Cells were infected with Ad.GFP/IGF2R-Rz or Ad.GFP treated with or without IGF-II and then analyzed by MTT assay. Each point, the mean of three separate experiments (n = 3; *, p < 0.05; **, p < 0.01 versus control). We examined the effects of ribozyme expression on apoptosis of cultured MCF-7 cells. After treatment with TNF, as shown in Fig. 6, a large number of control cells underwent apoptosis, as indicated by morphological changes (small round shape) and bright blue nuclear staining. There were significantly more apoptotic cells in control cultures than in cultures expressing the Ad-GFP/IGF2R-Rz. Accordingly, the number of viable cells, as measured by MTT analysis, in cultures infected with Ad-GFP/IGF2R-Rz was significantly (about 40%) higher than in cultures infected with Ad-GFP (Fig. 7A). The number of apoptotic cells, as measured by the cell death ELISA assay, in cultures infected with Ad-GFP/IGF2R-Rz was significantly (about 36%) lower than in cultures infected with Ad-GFP (Fig. 7B). These results are consistent with the hypothesis that decreasing M6P/IGF2R expression by ribozyme treatment can reduce cell apoptosis. Effects of the IGF2R ribozyme on the apoptosis induced by TNF in MCF-7 cells. Cells were infected with Ad.GFP (control, left panels) or Ad.GFP/Rz-IGF2R (right panels). 72 hrs post infection, cells were treated with TNF for one day and then cell death was examined using a fluorescence microscope. Upper panels: Cells were stained with Hoechst dye for nuclei and observed under 480 nm blue-fluorescent light. The bright blue spots are the nuclei of apoptotic cells. Lower panels: Cells were stained with Propidium Iodide dye for nuclei and observed under 565 nm red-fluorescent light. The red spots are the nuclei of dead cells. Effect of the ribozyme on the apoptosis induced by TNF in the MCF-7 cells. 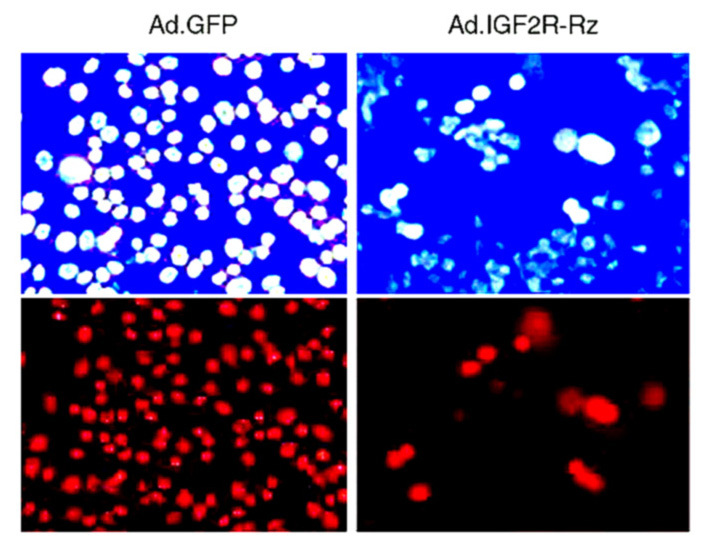 Cells were infected with Ad.GFP/IGF2R-Rz or Ad.GFP, treated with TNF and then cell viability was analyzed by MTT assay (A) and the apoptotic cells were assayed using the cell death ELISA assay (B). Each point, the mean of three separate experiments (n = 3; *, p < 0.05, versus control). A growing body of genetic evidence suggests that the M6P/IGF2 receptor is involved in carcinogenesis [15–29]. However, direct evidence of a growth-regulatory activity for M6P/IGF2R is lacking. In this study, using ribozyme technology, we demonstrate an association of decreased expression and function of the M6P/IGF2R with increased cell proliferation and decreased susceptibility to TNF-induced apoptosis in human breast cancer MCF-7 cells. Expression of the ribozyme targeted against the M6P/IGF2 receptor in MCF-7 cells resulted in down-regulation of M6P/IGF2R expression, as measured by RT-PCR, and M6P/IGF2R function, indicated by a decrease in internalization of 125I-IGF-II, and β-glucuronidase binding and endocytosis. Although we have not ruled out a RNAi effect in cells, the observed effects are likely the consequence of the specific cleavage of IGF2R mRNA by the ribozyme we used. MTT analysis and viable cell counts showed that ribozyme-mediated down-regulation of M6P/IGF2R also resulted in increased cell proliferation. Noticeably, the effect of ribozyme expression on cell growth was more apparent in the presence of IGF-II. This result suggests that the proliferative effect of M6P/IGF2R down-regulation is likely the result of unchecked IGF-II stimulation. Because the M6P/IGF2R is believed to sequester and degrade IGF-II , a decrease in M6P/IGF2R could result in decreased degradation and hence increased bioavailability of IGF-II to the IGF-I receptor, which mediates the growth-promoting effect of IGF-II. Supporting evidence for the involvement of IGF-II in the proliferative effect resulting from loss of M6P/IGF2R function comes from studies of M6P/IGF2R knock-out mice. M6P/IGF2R-null mice display global hyperplasia that coincides with elevated levels of IGF-II. Most importantly, however, the lethal nature of an M6P/IGF2R-null phenotype is reversed in an IGF-II-null background . Although we did not measure extracellular levels of IGF-II, our results show that ribozyme-mediated down-regulation of M6P/IGF2R leads to a decrease in IGF-II internalization, supporting the above possibility. Our results also showed that M6P/IGF2R down-regulation resulted in decreased sensitivity of MCF-7 cells to TNF-induced apoptosis. Although we do not rule out the potential contribution of the IGF-II pathway to this effect, we would like to consider other potential M6P/IGF2R-dependent mechanisms, such as lysosomal proteases and TGF-β signaling, that may directly affect cell sensitivity to apoptosis. Recent evidence suggests that lysosomal enzymes, such as cathepsins B and D contribute to TNF-induced apoptosis in vitro[35–38] and in vivo. The M6P/IGF2 receptor has been shown to be involved in binding, transport and activation of lysosomal enzymes, including cathepsins [12, 13]. Therefore, it is possible that down-regulation of the M6P/IGF2R results in improper trafficking and activation of cathepsins. This, in turn would eliminate the apoptotic cascades triggered by these enzymes under TNF stimulation and result in decreased sensitivity of MCF-7 cells to apoptosis. It has also been shown that TNF stimulation involves the activation of TGF-β [40–42], a potent growth inhibitor for many cell types and a ligand of M6P/IGF2R. In fact, activation of TGF-β requires the binding of latent TGF-β to the M6P/IGF2 receptor . Therefore, down-regulation of M6P/IGF2R expression could also lead to a decreased bioavailability of activated TGF-β, thereby decreasing the sensitivity of MCF-7 cells to the TGF-β apoptotic pathway. A detailed mechanism of the observed effect is currently under investigation. Our findings that ribozyme-mediated decrease in expression and functional activity of the M6P/IGF2R result in a growth advantage for MCF-7 cells indicate that this receptor acts as a negative regulator of cell growth. This is consistent with previous observations that M6P/IGF2R knockout mice displayed generalized increased growth and cardiomygaly (resulting from cardiac myocyte hyperplasia) , and that antisense-mediated reduction of M6P/IGF2R expression enhances tumorigenicity in JEG-3 cells . Thus, loss or mutation of M6P/IGF2R may contribute to development and progression of tumors via different pathways: by increasing the mitogenic activity of IGF-II and decreasing the apoptotic signaling of TGF-β and lysosomal proteases. Further studies using various cell types or using animals are needed to address this issue. Ribozyme technology, as we show here, is a useful tool for these studies. ribozyme, TGF-β transforming growth factor beta. We thank Dr. Alexander Leaf and Dr. Dennis Ausiello for their support and encouragement. We are grateful to Zhao B. Kang for his technical assistance. This work was supported by a grant from the NIH (CA79553 to JXK). ZC carried out ribozyme construction and functional assays, YG carried out virus construction, infection and RT-PCR, NL drafted the manuscript, JXK conceived the study, participated in its design and coordination. All authors read and approved the manuscript.